The EPA's risk-based licensing system aims to ensure that all environment protection licensees receive an appropriate level of regulation based on the level of risk they pose. Moving to a risk-based system is an important and positive change to environment protection licensing in NSW. The EPA undertakes risk assessments of all licensed premises in NSW in consultation with each licensee. The risk assessment examines site specific risks posed by each licensed premises to identify any environmental issues that a licensee needs to address and where the EPA needs to focus its regulatory attention. The EPA also examines the licensees' environmental management performance, which includes recognising any environmental systems and operations a licensee has put in place. Based on the results from the risk assessments licensees are allocated an overall environmental risk level (1, 2 or 3 - with 3 being the highest risk). Licensees with a higher risk level will receive an increased level of regulatory and compliance oversight, whereas licensees with a lower risk level will benefit from reduced red tape and reduced regulatory burden. In addition, licensees who perform well and minimise their environmental risk are rewarded with a reduction of their administrative fees, whilst poor performing licensees will pay licence fees that provide an incentive to improve their performance. Once environmental risk levels are determined for each licence they are published on the EPA's Public Register. This provides the community with more information about the environmental risks posed by licensed activities and the compliance performance of individual licensees. It also provides greater transparency and insight into the EPA's regulatory decision-making process. More information on risk-based licensing is provided in the Introduction of the EPA's risk-based licensing system. The EPA’s risk-based licensing (RBL) system has operated since 1 July 2015 and provides an incentive for environment protection licence holders (licensees) to maintain and improve their environmental performance by imposing higher licensing fees for poor environmental management and setting lower fees for better performance. RBL has also helped ensure EPA regulation matches the level of risk that a company’s operations pose to human health and the environment. We focus our regulatory efforts on those activities that pose the highest risk to the environment. The EPA continues to monitor the ongoing implementation of RBL, licensee risk levels and licensee response to a risk-based regulatory approach as part of its program of continual improvement. The EPA has started this review of the RBL system to identify opportunities to improve it. The EPA is analysing available information (including the results of risk assessments) and stakeholder feedback to identify if the system or support materials need to be refined. A detailed analysis of licensee data covering the period from 1 July 2015 to 30 June 2018. An audit of a sample of environment protection licensees that have claimed fee discounts related to environmental management system or practices. A survey of environment protection licencees and an opportunity for other stakeholders to provide early feedback. The EPA will provide information on the key findings of the review and any recommendations for change in 2019. Further feedback or questions can be directed to riskbased.licensing@epa.nsw.gov.au. 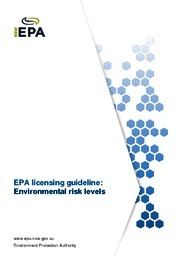 The EPA has developed a licensing guideline: Environmental Risk Levels (PDF 529KB) to provide the general public and the regulated community with information on the EPA's approach to environment protection licensing under the risk-based licensing system. The EPA's approach to regulating licensed premises is guided by the EPA's Compliance Policy, ensuring its compliance activities and actions are consistent, fair and credible. The EPA's Compliance Policy sets out a responsive and risk-based approach to the EPA's regulatory functions. The policy provides for an escalating regulatory response according to the risk to the environment and human health, the seriousness of the non-compliance, the apparent attitude to compliance, and the compliance history and frequency of issues arising. The risk-based licensing system aims to ensure that all licensed activities receive an appropriate level of regulation based on the level of risk they pose to the environment and human health. Proactive work is important and aims to address complex environmental issues to improve environmental outcomes. EPA state-wide programs best target regional, cumulative and load related issues and achieve the best environmental outcome. While individual licensed activities may not be assessed as high risk under risk-based licensing, they will continue to be considered by the EPA as part of these other state-wide, regional or local programs. The EPA is delivering several programs to target particle pollution and aimed at improving air quality in NSW. The EPA is driving reductions in particle emissions from open cut coal mines through the Dust Stop Program. This program included industry-wide consultation to identify management practices that deliver reductions in particle pollution and improved air quality. While the overall risk level of an open cut coal mine may be low, the EPA will continue to implement programs that target particle emissions at this premises through state-wide, regional or local programs.